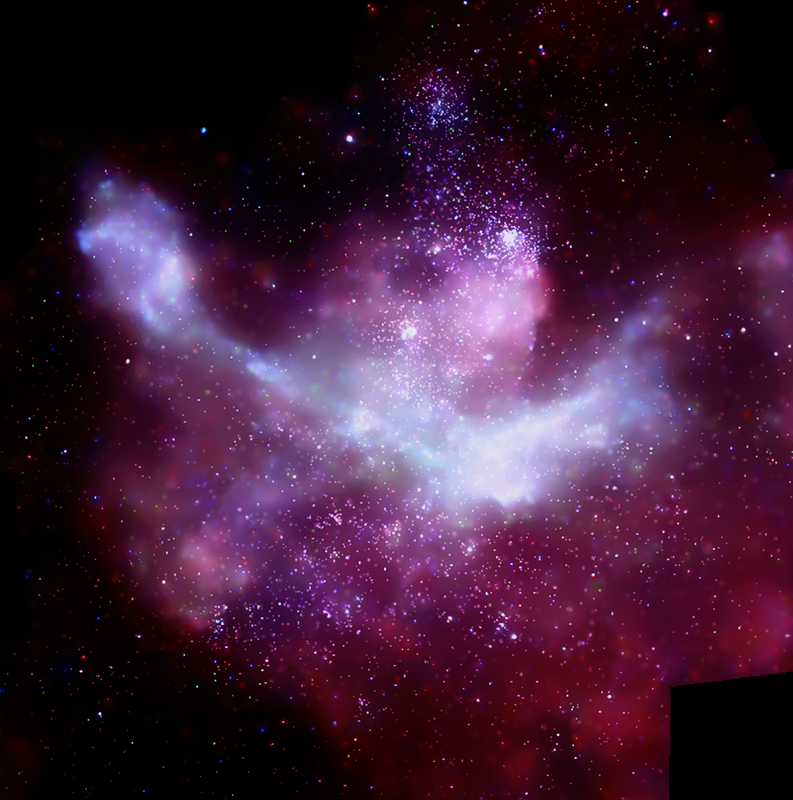 A new Chandra image shows the famous Carina Nebula with 14,000 stars and a diffuse X-ray glow. Over 1.2 million seconds -- nearly two weeks -- of Chandra observing time went into creating this mosaic of 22 different pointings. Evidence shows that many massive stars in Carina have self- destructed in supernova explosions. This large Chandra image shows the Carina Nebula, a star-forming region in the Sagittarius-Carina arm of the Milky Way a mere 7,500 light years from Earth. Chandra's sharp X-ray vision has detected over 14,000 stars in this region, revealed a diffuse X-ray glow, and provided strong evidence that massive stars have already self-destructed in this nearby supernova factory. The lower energy X-rays in this image are red, the medium energy X- rays are green, and the highest energy X-rays are blue. The Chandra survey has a large field of 1.4 square degrees, made of a mosaic of 22 individual Chandra pointings. In total, this image represents 1.2 million seconds -- or nearly two weeks -- of Chandra observing time. A great deal of multi-wavelength data has been used in combination with this new Chandra campaign, including infrared observations from the Spitzer Space Telescope and the Very Large Telescope (VLT). Several pieces of evidence support the idea that supernova production has already begun in this star-forming region. Firstly, there is an observed deficit of bright X-ray sources in Trumpler 15, suggesting that some of the massive stars in this cluster were already destroyed in supernova explosions. Trumpler 15 is located in the northern part of the image, as shown in a labeled version (roll your mouse over the image above), and is one of ten star clusters in the Carina complex. Several other well known clusters are shown in the labeled image . The detection of six possible neutron stars, the dense cores often left behind after stars explode in supernovas, provides additional evidence that supernova activity is ramping up in Carina. Previous observations had only detected one neutron star in Carina. These six neutron star candidates are too faint to be easily picked out in this large-scale image of Carina. Finally, a new population of young massive stars has been detected in Carina, potentially doubling the number of known young, massive stars that are mostly destined to be destroyed later in supernova explosions. These stars are seen as bright X-ray sources scattered across the image. Also shown in the labeled image is the most famous member of the Carina Nebula, Eta Carinae, a massive, unstable star that may be on the verge of exploding as a supernova. These latest results suggest Eta Carinae is not alone in its volatility within the Carina Nebula. Is there any star formation theory that attempts to explain the range of stars from smallest to super-giants? Just wonderfully mind blowing, mind building exposures. Thank you for the wonderful work you folks do. How is it posisibble that same stars in the same region are in creation or in their formation while others are dying thus cousing the supernovas? Thanks have learned a lot from Chandra. At the top, and center of the image there is a body, noticeably larger than the others. What is it? From a nearby galaxy or a giant star? Or, in a supernova explosion. As an Indian, I'm proud of Chandra. I love this blog, it teach me about the universe. This is most interesting, always something new to learn. Is this true only for this nebula or is this true for most nebula? Since this cluster is in our Galaxy, are there other images that have been taken of it? And if so, where would I find them? Are these the highest resolution images available? 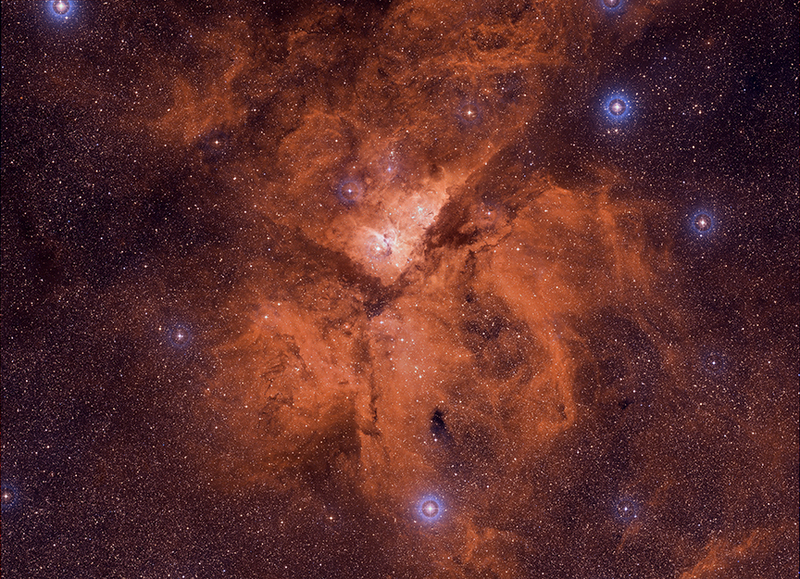 A star-forming region in the Sagittarius-Carina arm of the Milky Way. Image 1.13 deg across (about 148 light years).